When tools are complex and specialized you won’t get broad adoption in a multi-disciplinary project. 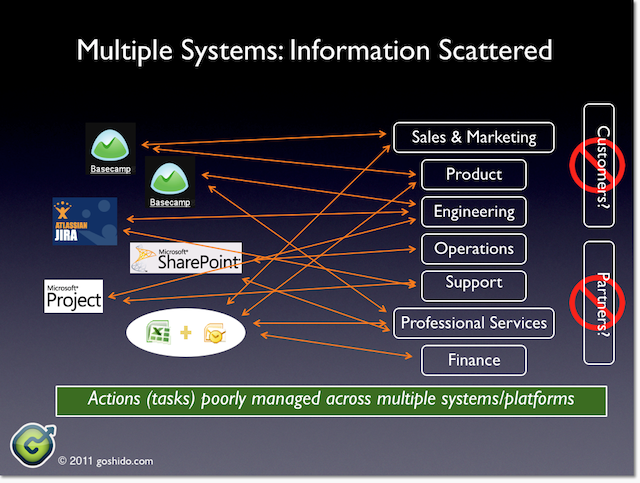 Critical project information gets scattered into a number of information silos. If the project management system doesn’t help the engineers get their job done, they won’t want to use it. If the bug tracking tool is too complex, the marketing team won’t want to use it. Goshido is simple enough for everyone on a multi-disciplinary team to use but powerful enough to drive the collaboration your business needs. Goshido provides tools for the individual to help them create a daily plan and select actions from larger projects they’re involved in. Now everyone can be on the same page. We provide simple & powerful solutions that make it easier for people to work together. Our software helps teams to execute projects - to keep all the moving parts moving. 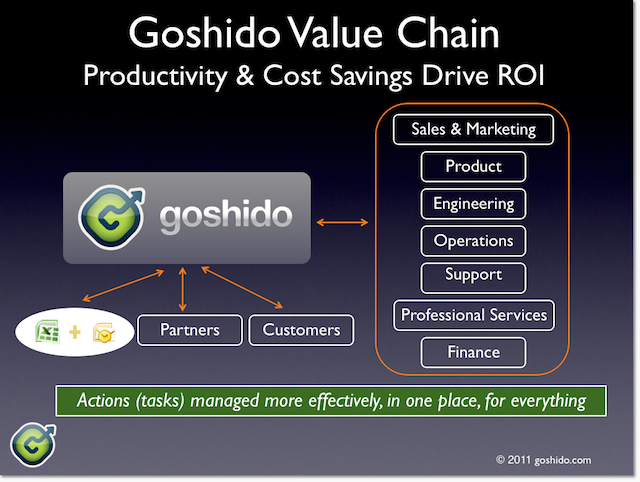 Today, hundreds of teams all over the world are using Goshido to get work done. These companies range in size from global multinationals to two-person iPhone game developers. When everyone on your team is focussed on doing the things that matter, work flows and you can accomplish the extraordinary.